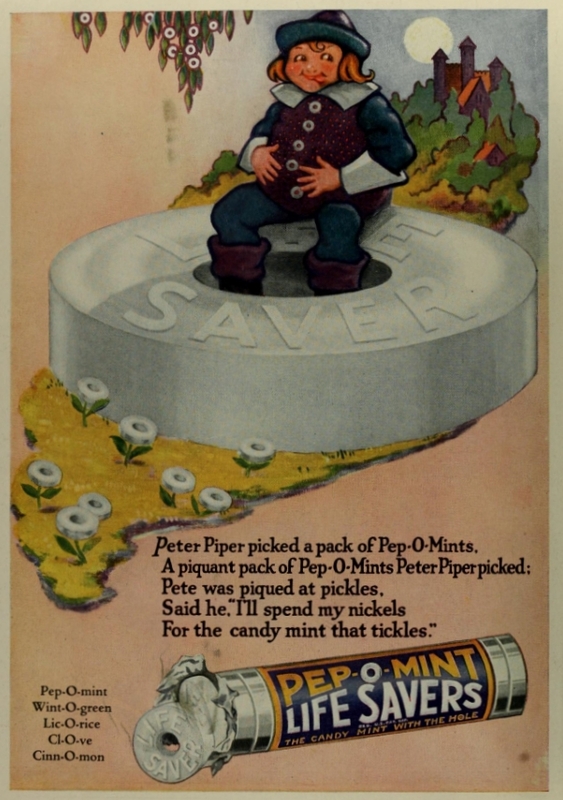 Clarence Crane, a Cleveland chocolate maker, invented Life Savers candy in 1912. The candy-with-a-hole-in its center became a nationwide hit, and remains popular a century later. Urban legend claims the hole resulted from a horrible accident in the Crane household: His young daughter supposedly choked to death on a piece of candy that blocked her windpipe. Hoping to spare other parents from the same tragedy, Crane put a hole in the new candy so that people who aspirated it would still be able to breathe through the hole. That's a myth, however, and Life Savers' shape had a much different origin. Crane had been selling handmade chocolate candy in the Cleveland area since 1891. Sales always slowed during the hot summer months, when chocolate melted quickly. So Crane decided to add a hard, non-melting candy to his product line to boost summer sales. Almost every candy shop carried pillow-shaped peppermint candies imported from Europe. Crane wanted his candy to stand out, and chose the hold-in-the-center shape as a marketing gimmick. The shape inspired their name. The candies looked like mini-life savers, flotation devices used to keep people from drowning. Crane also packed the candies into a distinctive cardboard tube, which sold for 5 cents. For the label, he seized on another marketing ploy. People often bought peppermint candy to hide bad breath, or the odor of alcoholic beverages. So Crane’s label showed an old seaman throwing a life preserver to a pretty female swimmer. "For That Stormy Breath," the label declared. The candy, however, got stale within a week and lost its flavor. Life Savers didn’t become a big hit until 1913, when Crane sold rights to the product to two New York businessmen for $2,900. One, Edward Noble, added the familiar foil wrapper to preserve freshness. The Wm. Wrigley Jr. Company makes Life Savors today and sells them around the world. The flavoring in wintergreen Life Savers contains molecules that exhibit triboluminescence. That’s the mechanical generation of light, which occurs when certain chemical bonds are broken by mechanical crushing. WintOGreen Lifesavers have such bonds. No other flavor does it, including peppermint. The process occurs in two steps. Breaking crystals of sugar in the candy first produces ultraviolet light. Then wintergreen molecules absorb the ultraviolet, and fluoresce, emitting a flash of visible light. One way to demonstrate triboluminescence is to chew a WintOGreen Lifesaver in a room in front of a mirror that can be made very dark. Try a bathroom or bedroom. Allow about 15 minutes for your eyes to adjust to the dark. With your lips open, chew one Life Saver and watch for the flashes. Each piece should flash many times as the chewing and crushing continues. Caution: Chew carefully to avoid choking, and don’t laugh or joke with friends. Young children who do this experiment should have an adult present. Crushing the candy with a hammer in a dark place also works.